Having spent much of the last year focused on startup work, analysis, and angel investing, I wanted to briefly outline a focal point of the efficiency technology segment that I gravitate toward. In particular, the most interesting opportunities revolve around existing activities that contain friction and inefficiency, and where the markets and providers seem comfortably numb — and where entrepreneurs with a blend of critical and strategic thinking have seen beyond existing models and methods. By evaluating issues facing each of an engagement’s constituencies, and re-thinking the engagement mechanisms of the activities involved, revisions for reducing or eliminating friction can be made to the processes so as to also elicit valuable inputs from participants, unlock additional value — even for bystanders, and/or open doors for new constituents. Entrepreneurs and companies who are doing this with a vision for what lies beyond initial disruption are the ones that really pique my interest. A great example lies in one of my earliest individual angel investments (outside of the Soundboard Angel Fund that I am involved with — which also subsequently invested). The company is Social Bicycles (a.k.a. SoBi), led by Ryan Rzepecki. Their focus at this point is in the bikeshare space, which is generally outlined pretty well in this article. 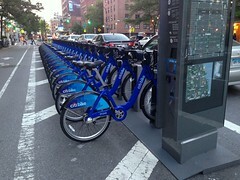 Some of the key issues around bikeshares (beyond those for the operator, such as reliability/repair/maintenance, loss of bikes, and fleet management and flexibility) tend to involve: ability for users to locate bike availability where they want it, and importantly, knowledge that there is space at their destination station to receive their bike. This is due in large part to bikeshares generally being “station” based. Such station-based systems have their “smarts” in the kiosk and rack assemblies that hold the bikes. Once you take a bike from such a system, you’re on your own until you bring it back into the system by parking it in another of the system’s smart racks. Obviously, the destination rack won’t always be at the exact location you’d like to go to, and when you arrive at the one closest to your destination, it may well be full — meaning you have to find another of the system’s racks in order to park/return it. Chances are, particularly if you’re using the bike for commuting purposes, you don’t have a lot of time to hunt for a parking space, nor do you have the flexibility to show up late because you were doing so. In contrast, (and not to oversimplify all that Ryan and Social Bicycles have done), SoBi has shifted the smarts and locks, from residing within the rack system to the bikes themselves, integrating GPS into the bikes, and using the cloud for procurement — and in so doing, they’ve evolved bikesharing to an un-tethered state. 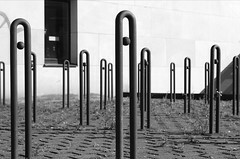 This means you can pull out your smartphone and find the bike closest to you, reserve it before you get there, unlock it on arrival, and take it wherever you want to go, without worrying that there might not be a space at your destination because, while they prefer you lock it to a designated regular old bike rack, in a pinch you can lock it to a tree or parking meter (local rules allowing). With reduced infrastructure requirements, other added benefits of this revised approach include significantly lowering the cost of entry, not to mention lowering the hurdle for any necessary approvals. The cost per bike is about a fifth that of a station-based scenario, and can be eased into and adjusted relatively flexibly in response to what is learned in regards to demand and patterns through operation. There are many other details to this particular system, and there are many other realms to which this approach of constituency analysis is unlocking real value. In future posts, I plan to share more about some of the other companies I have found to be doing this good work. (SoundBoard Angel Fund is a democratic fund, with members active in selection and analysis of companies and in ongoing relationships with its portfolio, which is primarly focused in education, consumer products and services, and efficiency technologies). Back in college (and we’re talking about the early ’80s), I’d thought little about crashing at someone’s pad – even someone I didn’t know when backpacking around. You meet some people you like, and you’re somewhere you’re not too familiar with – so what better way to get to know the place than hang out with some “locals” (even if they too were visitors to the place) – and take advantage of the convenience of being able to flop somewhere and leave your backpack while you’re out investigating. Nowadays I can’t imagine doing that – and I chalk it up to aging and parenting. Enter AirBNB. This is the peer-to-peer service you’ve heard about whereby you can rent a spot on someone’s couch for the night. Would I do this now? Probably not – but apply that concept to using a car, and maybe I would. That’s what Getaround is about. Need to use a car? There’s a car rental (peer-to-peer sharing) option that’s essentially a network of personally owned vehicles wired to be accessible for procurement via their smartphone app. Think Zipcar, but in a form that lets car owners leverage the downtime of their own car. Also in the space is Wheelz, which is similar to Getaround, but is focused on sharing within a known community (i.e. students on a campus), and now has Zipcar as an investor/partner. Yet other geographically focused services are RelayRides and Car2Go. Somehow I see myself more likely to be a user of the crowd-car before the crowd-couch. I guess I’m just more comfortable with the concept of peer-to-peer in this form – perhaps because I’d be awake, conscious and on my own (versus asleep and vulnerable). Call me old fashioned – but I’m trying.